Is this (the shape of) your next PC? Over the last few weeks I’ve had the opportunity to get up close and personal with a few too many Windows 8 tablets and laptops, and there’s been a form factor variation that seems to be a winner in the long term, and that’s the dockable tablet. The main one I have been able to spend a few weeks with is the Lenovo ThinkPad Tablet 2, but there was a brief dalliance with the HP ElitePad and some of it’s different expansion sleeves. What’s so special about this form factor? The dock is really the key differentiator, as it acts as the stand as well as providing HDMI, USB, ethernet and audio ports. Docking is a simple process, and everything lights up once you are connected. No fumbling with power and USB cables, which makes it very user friendly. 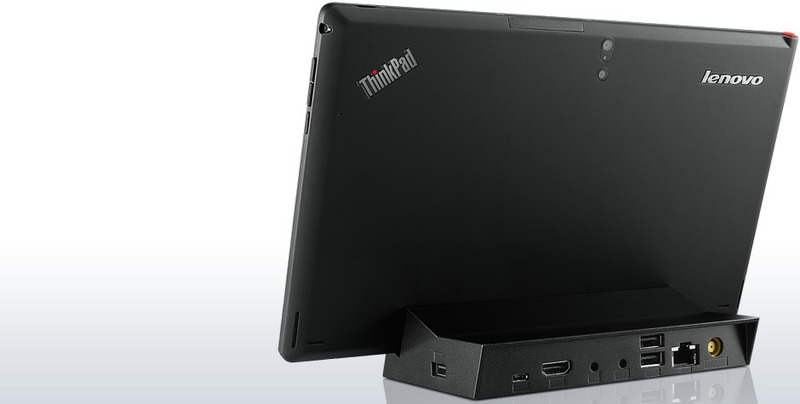 Here’s an image from Lenovo which highlights the ports that are available. Through Bluetooth or USB you can connect your preferred mouse and keyboard, have your headset connected, as well as a wired network connection to help out your non-wired neighbours. It’s a great solution, it would be great to see the dock size be standardised for a vendor so that it could survive at least one generation of tablet updates. One of the issues with alternate dockable tablet form factors is that some essentially dock into a keyboard that may just have a power connector and a single USB port. This means that in order to keep the user experience simple you would need to look at something like the Targus USB 3.0 solutions I have used previously. The last thing you want is for a user to plug in all of the required connectors whenever they are at their desk, with the cables protruding from all over the device. An unanswered question is what types of docking solutions may be in the works to take advantage of the extra connectors that the Surface Pro has. If Microsoft is serious about Surface Pro in the enterprise, then the idea of specific docking solutions, by Microsoft or other vendors, will be something that is needed. All I can say for now is watch this space. The Lenovo and HP devices are currently Atom based, 32 bit, and limited to 2GB of RAM, so they aren’t going to be desktop replacements, but over time there should be more advanced hardware in these small form factors, without compromising the long battery life these devices have. After my hands on time with the Lenovo I can really see them challenging the current generation of Windows RT devices, including Surface. Why the challenge to Windows RT? Well, the main benefits of Windows RT – low power consumption, lighter devices with longer battery life also apply to the latest Atom SoCs from Intel. These devices have an ace up their sleeve in that they are x86 compatible, so your existing 32 bit Windows applications should continue to run, including the different flavours of Office. Yes, this means that you can run Outlook. Real Outlook. Sounds like a winner to me. Next Next post: Windows 8 App Updates–Is It Time For You To Retire Outlook?